I've been on a health kick of late, well, since Christmas. I've lost a significant amount of weight, but haven't stopped cooking and eating really tasty and different food. All I've done is replace the obvious carbs (bread, rice, pasta, potatoes) with less obvious alternatives. I'm trying to make the meat we eat special, then pickling all sorts of veg to go alongside, and eating an awful lot of Chinese Leaf cabbage. Is it cabbage, or is it lettuce? Not really sure, however the Japanese eat a lot of it with fried bread-crumbed pork, so I thought it worth a try. It's fair to say that I fell for it hook line and sinker either with home made Tonkatsu sauce, or Bulldog brand Tonkatsu purchased online at Sous Chef (like many of the odder ingredients I seek out). Tonkatsu is kind of like a Worcestershire sauce ketchup, but please don't let that put you off!!! 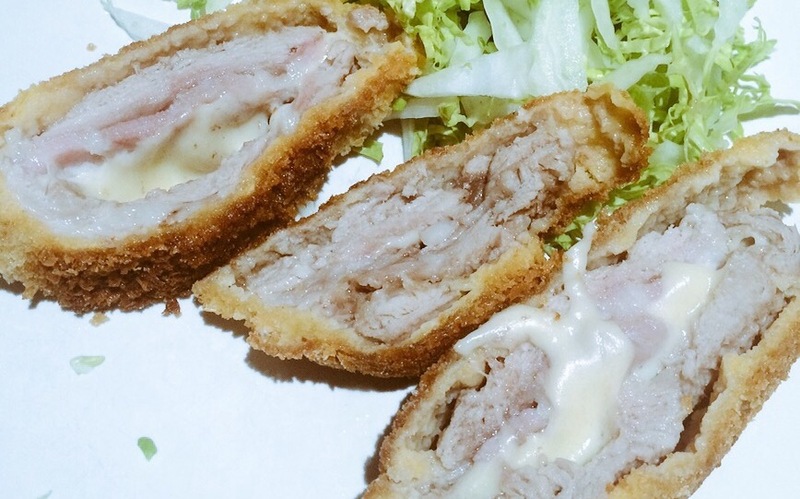 The traditional Japanese version is simply a boneless pork chop, battered out a little thinner, they then pané the chop (passing through flour, then egg, then panko breadcrumbs) and deep fry or shallow fry but in deeper oil than perhaps under normal circumstances. They then serve simply as per the picture with very finely shredded Chinese leaf, and some Tonkatsu sauce. I'm not sure if I prefer the sauce on the meat or on the leaves, so usually end up with both! The reason I've called it "kind of" Tonkatsu is because we had it as a family for the first time, and one of my daughters suggested that it would be nice with mozzarella cheese inside. Of course, their wish is my command under all circumstances (?!?!) so I thought I'd give it a go. Having had some interesting experiences with stuffing various cuts of meat, usually ending up with the need to cover my creation with sauce due to the explosion of molten cheese, I thought about encasing the cheese in another of my favourite things. Parma ham. I cut a good sized pouch in to my boneless pork chop. Then took a nice slice of mozzarella and wrapped it tightly in Parma ham. Then I placed the ham and cheese parcel in to the chop and pressed firmly around the edges. Then passed it through plain flour, then whisked egg, then finally in to Panko breadcrumbs. You can get these everywhere now, but again, Sous Chef do good ones for about the same as supermarkets. Then all that's required is shallow frying for about 8 minutes on each side. If you're worried about it not being done, you can always pop it in to the oven for a few minutes to make sure. It stays moist due to it's internal surprise so if you are cautious about pink pork then go ahead. It's worth saying however, that if you buy pork from a butcher who knows where the animal was from and how it was raised and slaughtered etc, then eating pork on the pink side is no problem, and actually desirable in this house. I wouldn't eat it pink from the supermarket though. The legal temperature that pork can be served at in the USA was reduced by 9.5c in 2011, down to 62c, which would be pink, so it's up to personal taste. Whether you use mozzarella, cheddar, or any other decent melting cheese is entirely up to you. Worth trying it without as well, the Japanese do know a thing or two about what tastes good. Just make sure you either make or buy some Tonkatsu sauce as it really makes the dish come alive. I'll post two recipes for the sauce, which if you make, then combine, it works brilliantly. Woah these recipes are quite a healthy one. And people who are quite unhealthy can have them in their daily routine. And of course, they are also perfect for some party dinner/lunch.